Monday Motivation: What priorities should I set? If you’re like me, you probably have more things to do in a day than you can possibly accomplish. 1. Does this task fulfil my purpose in life? What were you made for? I know I’ve blogged about this before, but it’s an important question. If I’m going to finish my day without regrets for time poorly spent, then I need to think about this question. For me, ultimately, my purpose is to serve God in the way he made me. So I can break this question down into: Does this glorify God? Can it glorify God? (Even the lowliest task can glorify God if your heart is in the right place) Does this play to my strengths? Is this part of what God put me on this earth to do? Now that we’ve determined this, now we move on. 2. Does this task honour a promise? If I’ve committed to do a job for someone, then I need to do it before the things I want to do. That doesn’t mean spending my energy recklessly all on other people and neglecting my own and my family’s needs. But I can set realistic goals for finishing these projects in a timely manner. 3. Does this task invest time and energy that will result in more time and energy? Eating healthy, exercising, creating, relationship – all of these things give back as much as they take. I need to make time for these things to clear out the cobwebs in my mind and body so that I can better accomplish the other things on my list. 4. 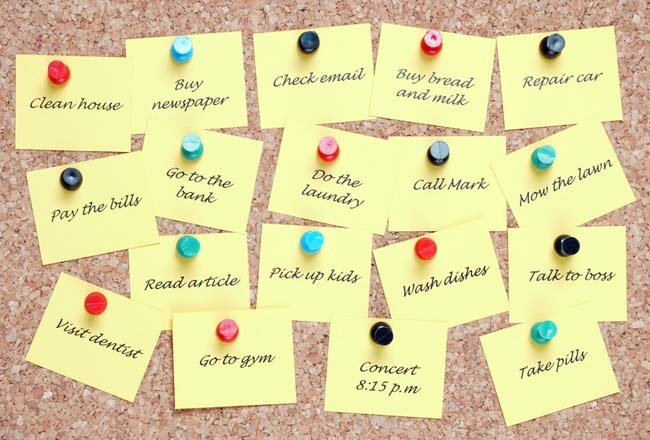 Do my prioritized tasks throw my life out of balance? Now I need to look over my list and make sure I haven’t stacked my priorities all in one area. Am I putting too much importance on housekeeping? Am I planning to delve too deeply into writing? I’m I stifling my creativity by focusing only on necessary evils? Am I giving myself too much relaxing time? 5. Does this task even need to be on my list? I need to think extra carefully about whether tasks need to be a priority at all. Maybe there are a few things that can be dropped from my list that I have been placing too much importance on. If a marketing task is having no effect on my sales or platform, I need to cut it loose. Maybe I don’t need to do deep cleaning – those baseboards can stay dusty. I’m going to have to take a good hard look at this now. Now that I’ve thought about it, I can put a number of priority next to items on my to-do list. And then, most importantly, I need to set into doing them without guilt for the tasks at the bottom of the list, or the ones that got cut. Awesome post! So near and dear to my heart. I appreciate your step-by-step approach to choosing where to spend your time – and what items become priorities. My list is similar, I use #5 before I write the task down, then again when I prioritize. I find that sometimes unimportant tasks creep up and I need to very diligent about not allowing them to infringe on my time! Thanks for the excellent wording in #3 – “Does this task invest time and energy that will result in more time and energy?” I often have a difficult time explaining to my clients WHY we want to spend time on activities that reside in Covey’s Quadrant 2 – and this phrase sums it up perfectly.